Guests are spoil for choice in every way in the beautifully landscaped 5* luxury resort of Rixos Sharm El Sheikh. Situated in Nabq Bay, 8km from Sharm El Sheikh Airport. The property enjoys a 330 meter private beach with jetty and Diving Center. For more water, splash in one of the 11 swimming pools (7 adult and 4 children’s pools) or the Mini Aqua Park including 3 water slides. There is plenty more to enjoy within the resort – in addition to our nightly shows, the daily activities include aqua aerobics, darts, water polo, beach and water volleyball, boccia as well as themed activity days. Children can enjoy both day and evening activities at the popular Kids Club. For the health and beauty conscious, try Pilates or yoga; at the Spa enjoy treatments at the Beauty Salon or simply relax in the Turkish Bath, Relaxation Room, Steam Room, Sauna and Jacuzzi. There are also two tennis courts, a billiard table, a gym and table tennis. 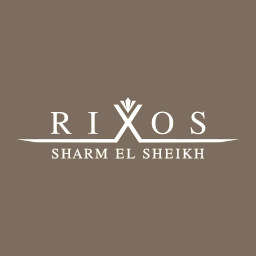 You are spoil for choice with the Rixos Sharm El Sheikh’s drinking spots – you can drink the night away by the pool, in one of the many bars, with music, with a traditional water pipe (Shisha) or with the latest sporting events on the big screen. The dining choice is even more extensive – choose from any of the 8 restaurants offering wide range of international, Italian, Chinese, Egyptian, Indian or Japanese dishes. Other facilities include a selection of on-site shops, laundry service, resident doctor available 24 hours, clinic, free wireless internet access around the resort (use your own laptop), taxi/limousine service and free shuttle bus to/from Na’ama Bay twice daily.